East Bay Rep. Eric Swalwell kicked off his 2020 presidential campaign with a rally in Dublin Sunday afternoon. Marianne Favro reports. 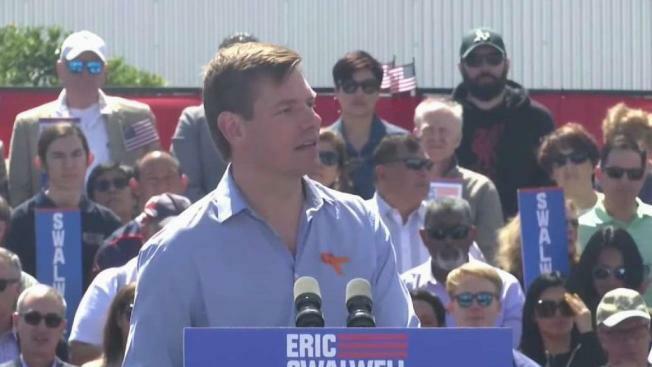 East Bay Rep. Eric Swalwell kicked off his 2020 presidential campaign with a rally in Dublin, California, Sunday afternoon. Speaking to an enthusiastic crowd at his former high school, the 38-year-old Democratic congressman who represents California's 15th Congressional District addressed his humble beginnings and understanding firsthand what it is that working people need. Swalwell, a prominent critic of President Donald Trump, talked about the need for inclusiveness and an economy that works for everyone. He also made addressing gun violence and school shootings a centerpiece of his campaign. "That's why I started my campaign at Parkland," Swalwell said Sunday. "I pledged to that community what I pledge to you: I will be the first campaign to make ending gun violence the top priority in my campaign." Swalwell officially declared his bid for the 2020 presidential race Monday evening in an appearance on "The Late Show with Stephen Colbert" after much speculation and visits to Iowa, New Hampshire, Nevada and other states in the months leading up to the announcement. He said in a clip that was released by the show: "I see a country in quicksand, unable to solve problems and threats from abroad, unable to make life better for people here at home. Nothing gets done. I'm ready to solve these problems. I'm running for president of the United States." Swalwell, an Iowa native, was elected in 2012 to represent California’s 15th Congressional District. He joins what is expected to be a wide-open race for the Democratic presidential nomination. There's no apparent front-runner at this early stage, and he will face off against several of his Senate colleagues who have more name recognition.